Star-Crossed Lovers. 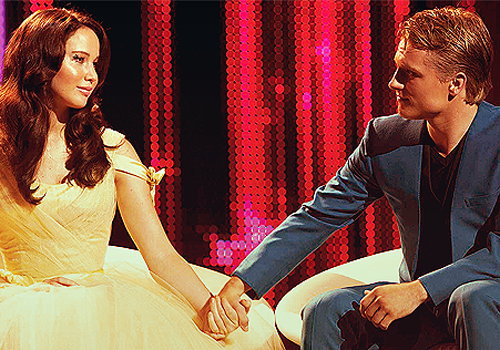 Katniss and Peeta being interviewed after they won the 74th Hunger Games!. Wallpaper and background images in the The Hunger Games club tagged: hunger games the hunger games movie katniss katniss everdeen peeta katniss and peeta. This The Hunger Games photo might contain bridesmaid کی, غیرت کے نام پر نوکرانی, لوکنی, نوکرانی کا اعزاز, ڈنر کپڑے, رات کے کھانے کے گاؤن, رسمی, شام کا گاؤن, رات کے کھانے کپڑے, رات کا کھانا گاؤن, گاؤن, and gown.